While it’s been a while since my last update, I had told myself that once the new administration got up and running, I would take a watch and see attitude for a season to get a feel for the direction all this promised “change” would take us. Well, let me say it’s been an eye-opening season, to be sure, and I believe if we understood what was really going on beneath the surface we might be overwhelmed by the sheer magnitude of the global transformations taking place right under our noses. I am going to talk about such transformations this morning. And because there is so much going on in the world, this will be a 2 part update. And in light of all that is going on just ‘under the surface’, this graphic of the Titanic pretty much says it all for me this week – I’m sure you know the story. 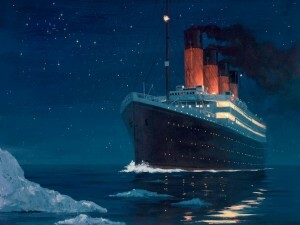 And the expression “just the tip of the iceberg” was in use long before that ill-fated ship went down. Now, one of the characteristics of the iceberg is that roughly 85% of it remains under water –it’s just the tip that we see above the surface, so when you say that a situation is just the tip of the iceberg, what you mean of course, is that it’s much more complex than it appears to be. I also looked up the definition of the actual word, “titanic” and it means, “of enormous scope, power, or influence – a deepening sense that some titanic event lay just beyond the horizon”. I don’t know about you, but I’ve had that very sense for a while now, and this morning I want to give you an idea of what kind of titanic events are laying hold of our planet, that I feel qualify for a “just the tip of the iceberg” list. So, grab your life preserver, and let’s get started. Since I first began to look into prophetic topics many years ago, I realized early on that as complex a subject as it is, most important prophetic news stories will contain insight about one or more of these three topics: the formation of a global government; a global economy, and the subtle but rampant spiritual deceptions that will indicate a global religion is on the horizon. Now, Israel is the timekeeper for world events, so we are always keeping an eye on what is going on there; but I always have these three topics in mind when I do research. Today I am only going to cover the latest in the economic situation because it is setting the pace for everything else. Next week, I will cover global politics and global spirituality. Think back to the beginning of this year, 2009, when you first realized that the world was undergoing some pretty profound changes, when it first hit you that those in power in our country seemed to be playing by a new set of rules – probably right about when the financial rug was being pulled out from under us. The epicenter for change seemed to be the US but the aftershocks of our mess were instantly, digitally global. Suddenly, calls for a global currency to right this ship seemed to come out of nowhere. But since foundational changes to our world system don’t happen overnight, I had a strong ‘tip of the iceberg’ feeling about this entire mess. And of course, no crisis these days is wasted by the powers that be whose goal is to remake the world in their own image so now I’m thinking, yep, there’s an iceberg out there. And I was right, there is much more to this story. Back in early April of this year, the G-20 held a timely summit, to try and stop the bleeding of the world’s financial markets; after all, in a very short time, stock markets around the world had lost half their value. In fact, the entire financial structure of the planet was spinning out of control, and still hasn’t bottomed out. But if you’ve been waiting for the proverbial other shoe to drop, I am going to suggest this morning from a prophetic perspective that it already has. I have been asked about what really happened at that summit, and so here we go. If I were to ask you what the G20 is, you might say they are lawmakers/political leaders from around the world. In reality, the G20 is an organization of CENTRAL BANKERS and finance ministers of the 20 major industrialized nations, along with the president of the World Bank and the IMF (Int’l Monetary Fund). What is a central bank? Let’s camp there for a minute. Simply put, a central bank regulates and controls the money supply of a nation or group of nations, they maintain the stability of the national currency, set interest rates, and loan money to other banks. Examples would be the Bank of England, Bank of Russia, European Central Bank, etc. In the US, it would be the Federal Reserve. In a nutshell, the Fed is a private bank, not a federal agency, but they collect billions of dollars in taxes from Americans every year. Now, this is an update in itself, but let me just say this: one reason people have a problem with the Fed is that nowhere in our constitution does it give the right to create or regulate our money to private bankers. But the reality is that a decision made by one man back in 1913 is still affecting us all every single day. That man is Woodrow Wilson, who was elected president of the United States thanks to a relationship he entered into with a group of wealthy businessmen – J P Morgan, Paul Warburg and John D Rockefeller. With their connections and wealth, they were able to put a banker-controlled President in the White House. On December 22, 1913, after many members of Congress went home for Christmas, the Federal Reserve Act was rammed through and President Wilson signed it into law. In doing so, he effectively placed control of the US economy squarely in the hands of the private bankers, who would go on to create massive amounts of credit – backed by absolutely nothing. They did this by printing new bank notes and lending them with added interest to the Government for redistribution. This means that every single dollar in circulation has a debt attached, payable to the Federal Reserve. All your paper money says, ‘federal reserve note’ on it. “I am a most unhappy man. I have unwittingly ruined my country. A great industrial nation is controlled by a system of credit. The growth of the nation, therefore, and all our activities are in the hands of a few men.” Basically, he sold his soul for the White House, and the chickens continue to come home to roost. With that bit of background now– let’s get back to the G20: just 8 weeks ago, this group of central banks issued a communique that announced the creation of the Financial Stability Board, or FSB. At this gathering, our current president agreed to enter the US into a financial arrangement that will regulate our economy in terms of international interests. Effectively, the FSB gives birth to what is no less than a global monetary authority. The head of the FSB is Mario Draghi, Italy’s central bank president, and his office is in ROME. Draghi was the former head of the World Bank, and at one time Draghi was managing director of Goldman Sachs, along with his comrade in international finance, Henry Paulson (our former Sec’y of the Treasury). They both bailed from Goldman’s before the financial meltdown, and now Draghi runs Italy’s Central Bank and the FSB. He is one powerful man, and I bet you’ve never heard of him. On a side note, there is an FSB in the US now, and it’s run by none other than Henry Paulson. The FSB operates out of Basel, Switzerland, within the global powerhouse central bank called, “The Bank for International Settlements”, or BIS. The BIS is completely above any law of the land. They are a sovereign state; their personnel have diplomatic immunity, they pay no taxes; the government of Switzerland has no authority there and can’t even enter their property without their permission. They are the Central Banker’s bank – the financial mothership of the world. There are 55 central banks in the world; but the BIS board is made up of the top 11 central bank bankers, who fly into Switzerland regularly for top secret meetings, where they pull the strings of the world’s economy, answerable to no one. By the way, the top 11 central banks who answer to the BIS are, for some unknown mathematical reason, called the Group of 10. Read Revelation for some insights into those numbers, see if any bells go off. Additionally, the FSB is primarily under the control of the European Union- that’s pretty significant prophetically- which has wanted to get their hands on our financial system for 200 years. Or as I like to say, “England called, they want their country back.” And you’re probably wondering about our Constitution right about now. Join the club. Here’s the bottom line on this: experts are saying that the purpose of this financial crisis is to take down the US and the dollar as the world reserve currency. According to Bloomberg, global leaders want a new world order that is less US -centric, bringing international institutions to the fore. The vice chairman of Goldman Sachs said of all these developments, “it is the end of an era”. When the Chinese and Russians, and just this week Brazil, recently called for a world currency, they meant one that would not represent any specific country. What is to take it’s place? The G-20 banks are now going to invest in the IMF as the cog in the global currency wheel. Widely dismissed as irrelevant only months ago, this UN financial invention will be the recipient of unprecedented funding by the developed nations of the world. Japan, the US, and the EU are each pumping $100 million into the IMF to create something called IMF bonds. In a bid to re-engineer the global financial system, Russia, China and Brazil are also investing billions to introduce a new global currency on the world scene, one that any nation can draw from and invest in. There is no production or property behind what they call the IMF’s Special Drawing Rights, they just make money out of thin air, then charge interest on something that doesn’t even exist. Call it clown currency, funny money – these bankers are now in full control of the country – the planet – and they dictate policy covering everything from your retirement income to shareholder rights. By the way, Henry Paulson is also on the board of governors of the IMF. Welcome to the last of the last days. Another development that bears a mention is that 2 weeks ago Wednesday, our president proposed the most sweeping overhaul of the way the U.S. government oversees financial markets since the 1930s. He is pushing Congress to grant the Federal Reserve and the executive branch of government vast new powers to supervise and reorganize the economy. He is proposing that the Federal Reserve oversee not just banks but any large firm that poses a risk to the economy in case of failure. - Give the Federal Reserve more power over payments and settlement systems. - Set up a new consumer protection agency with the ability to write rules related to mortgages, credit cards and other consumer products. - Coordination of insurance regulation. - Require more scrutiny of credit-ratings agencies- this one is particularly scary, because imagine what they could do to a company or even the average person if they overhaul that system and reset the credit numbers – a reset of everyone’s credit rating could greatly damage or even destroy our ability to get or pay back loans. I also found in my research, that our central bank is not the only one being restructured around the world. And this should be no surprise, if it is indeed true that the world is becoming one, cohesive, cooperating financial unit. And if time is truly as short as we believe it is, preparation for fulfillment of Revelation 13, in which one man is able to take control of all buying and selling in the world looks to be nearly complete. This regulatory oversight that will be bestowed on the Fed by the end of this year cuts a broad swath across our country. For example, investors believe it is very possible that one of the companies that the Fed will take over when this passes is GE, because of GE Capital and it’s huge influence on the markets. Since GE is so diverse, as many multinational corporations are, any governmental control of a company like that would include controlling it’s subsidiaries. GE owns and operates a huge chunk of the healthcare sector, media such as NBC and it’s various media outlets; environmental groups controlled by GE; they are the largest manufacturer of jet engines and own several diverse transportation companies, and the list goes on and on. It staggers the mind to take this to it’s logical conclusion as there seems to be no stopping this freight train and the potential for complete control of our infrastructure. Here are my observations, having tried to understand it all and realizing I am just another extra in this disaster movie: the world of economics today can be nearly impossible to understand, and who but a few can really claim to follow the money trail? By creating a crisis that can only be solved by those fluent in a language and system, the average person despairs of keeping up with it all – so now we are outside of the process, and have turned it all over to the so-called experts to fix it any way they want. Enter then, a political revolution, while we are all just in a vulnerable survival mode. Politics is much easier to follow, but who cares at this point? I just want to eat and pay my bills. Bail me out, Scotty! And so, another word has entered our timeline that comes conveniently on the heels of this money meltdown. That word is “Socialism”. The economic crisis has conveniently created another one, one that is both economic and political in scope. In order for global systems that allow people to be monitored, tracked, governed and budgeted to be in place, and to enable humans to see what is going on in the world at any given moment, there must be in place a worldwide infrastructure of technology, the planet must be wired first. Big brother needs digital eyes. Daniel 12:4 says that in the last days knowledge will increase, and anyone can see it’s fulfillment daily. A powerful economic system has been setting the prophetic pace because of technology; now a select group of financial leaders can buy and sell and create money out of thin air with just a keystroke, or destabilize a nation or people. And with RFID chips being put into our automobiles, our clothing, and even an RFID ink that can be tattooed on our skin to identify us, there is nothing standing between us and Revelation 13. Technology is the superglue that binds economics and politics together to create a time such as has never been on the face of the earth. Let me say on behalf of all of my updates: my goal is never to bring any fear to your hearts but to make it clear as day that the time is short, that what the world is going through must take place as we move from the current kingdom of man to the kingdom of God in which righteousness dwells. It’s going to be bumpy – and so we need to keep our perspective, as there is not one thing any of us can do to change these momentous events; but see it is a privilege and calling to be living in these times – and above all, look up and rejoice because our redemption is at hand. AND – make sure you take in the Revelation study here at Calvary, that is just around the corner. Thank you for a well written piece.